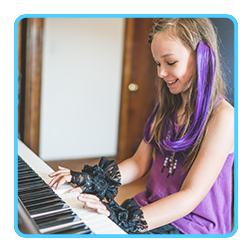 Private and Semi-Private Piano Lessons in Lemont, Lockport or Bolingbrook! Private piano lessons are one-on-one instruction for students of all levels and abilities. This allows us to customize a program to your specific needs and goals. Our beginner program features a ½ hour lesson each week which combines learning proper technique, theory, and developing repertoire. For older and/or more advanced students, 45-minute and hour lessons are also available. Semi-private piano lessons are available for 2-3 students who are siblings or friends of approximately the same age. The material is customized for these students as they learn together, and they may easily progress to private lessons after some time together if the students wish, or at the teacher’s recommendation. Private and semi-private piano lessons are available from Monday – Thursday, between 2:00 p.m. and 9:00 p.m.; on Fridays between 3:00 and 6:00 p.m; and in limited quantities on Saturdays. Please call us for availability and tuition information.